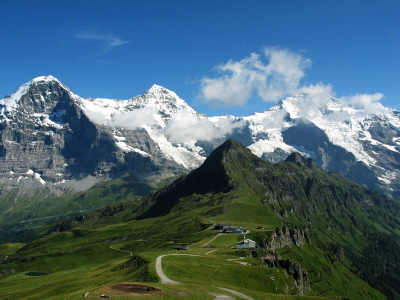 Swiss Alps Jungfrau-Aletsch is an impressive landscape and an outstanding example of the formation of the High Alps. It includes the most glaciated part of the mountain range and the largest glacier in Eurasia, the Aletsch Glacier. The area holds 9 peaks over 4,000m: Finsteraarhorn, Aletschhorn, Jungfrau, Mönch, Schreckhorn, Gross Fiescherhorn, Hinter Fiescherhorn, Grünhorn and Lauteraarhorn. 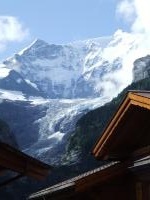 The Jungfrau was first climbed in 1811 and the Finsteraarhorn in 1812. It is still a popular region for mountain climbing. When I was a child, we always went on holiday to the Allgäu Alps. Living near the German border, my parents only spoke German as a foreign language and felt the most comfortable in German-speaking countries. We went there so often that we even were designated by the local tourist organization with a special pin celebrating 10 (or 15?) visits. So I have seen my fair share of Alpine landscape and know the omnipresent sound of cowbells. Although I must confess that when I got older I skipped all the hiking and my parents often left me at the hotel with a book to read. This background might be the reason that I left it so long to visit the Swiss Alps WHS. But also the site’s inaccessibility played a part: the WHS originally encompassed only the Jungfrau-Aletsch area, which is quite costly to visit and doesn’t lend itself for a short weekend break. Since 2007 however, the core zone has been extended across a wider area in the Bernese Alps. Additional access points to the east and west have come into play. I choose Kandersteg as my base, a town some 2.5 hours from Zürich Airport. From here a cable car takes you for 18SFR to the Oeschinen Lake, which lies already within the inscribed area. At a gloriously sunny Friday in late June I arrived at the top cable car station around 10 am. From that point a number of hikes are signposted, of which I took the ‘Heuberg Panoramaweg’. Most people will just walk half an hour down to the lake, especially the groups, but this route follows a path on a ridge somewhere mid-level up the mountains. It has great views on both the lake and the massif of High Alps. The highest top you can see from here is the Bluemlisalp with a height of 3,661m. The route steadily goes uphill for the first 1 to 1.5 hours. A few times I had to cross little streams coming down from the mountains, once even I got my socks totally wet. But there are many places to rest, and I dried my socks for a while in the sun. There were some 10 other hikers active on this route this morning, and we kept on seeing and passing each other all day. The trail takes 3 to 4 hours to complete, but most took it slowly and sat down often to enjoy the views. At Underbärgli (a spot with a few farms near the far side of the lake) there’s a nice little café where I had the soup of the day for lunch. It’s all downhill from there. The path stays on the same side of the lake, and now has fine views of its pebbled beach and enclosed setting. The Oeschienen Lake is a 56m deep glacial lake and one of the larger Alpine lakes. It is fed by the glaciers of the surrounding peaks. It is possible to walk back to Kandersteg from here instead of taking the cable car back – I did so and it took another hour. You won’t see anything though that you haven’t seen earlier in the day and it takes some additional concentration as it is steeply downhill on a terrain of loose stones. Remarkable about this WHS sublocation is that they haven’t pimped it. It is what it is: an Alpine mountain landscape with a lake, with hiking paths and two or three places to have something to eat or drink. No adventure sports, no interpretative trail, no visitor center. Kandersteg itself has been a tourist destination since the late 19th century. Nowadays it's a somewhat oldfashioned town, still popular with elderly British. My wife and I visited Jungfrau in August 2017. We managed to luck out with our visit, with super clear skies and reasonable temperatures both in the valley and up top. Given the prices and the crowds, I would strongly recommend purchasing the "Good Morning" ticket, which offers a substantial discount (down to about 120 CHF per person). You need to be on one of the first two trains up in the morning (departing Grindelweld at 7:25 or 7:40), and then descend again from the mountain by around 1:30pm. Staying in Grindelweld, we managed to make it up on the first train, skipped over the first parts of the tour and were on the first elevator to the top of the observatory, meaning that we had it entirely to ourselves for about 10 minutes. Fantastic! Though it did fill up with obnoxious tour groups after about 45 minutes. I would also strongly recommend doing the glacier walk out to the far viewpoint, as you get a completely different view of the area. Although it's shown as 45 minutes, it's probably closer to an hour unless you're an experienced snow walker. We took an hour, though our miniature dachshund (teckel) slowed us down quite a bit! All in all, a great day and we were very glad of doing the research to get the cheaper tickets, making it up before some of the crowds, and descending early afternoon for a rest and a well deserved beer. The previous day when I checked the hiking trails and the weather I was already given a warning: snow and rain. I had packed accordingly. Still, I was not prepared for how little I would actually be able to make out of my visit. The view was limited to 20m and the trails were not discernible. While I hiked a bit in direction of the viewing platform, I eventually turned around as I couldn't make out the path and simply didn't feel safe. After I had resigned myself to the fact, that I would neither see the glacier nor be able to hike in the high mountains, I took the next cable car down to the valley. From there I went back to Brig and took the train the Kandersteg. 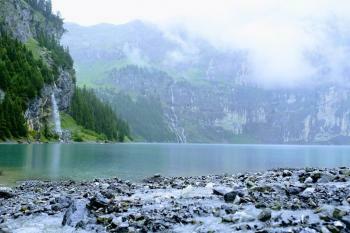 The scenery around Kandersteg is nice with plenty of waterfalls coming down the mountains. And due to the lower altitude the scenery wasn't hidden in heavy fog. Same applies to snow. Instead I got heavy rain. While I have counted this as visit, I have made a mental note to come back here eventually and to see the glacier in its full beauty. This time I would come in from Milan, though, as it's closer to the Southern side of the glacier than Zurich. This is assuming, there will be some of it left when I come back. The most expensive and probably also the most touristy option is to take the train up the mountain. In total be prepared to dish out 200 CHF (190 CHF for the train ticket plus 10 CHF for the seat reservation, 2017 prices). While Clyde's pictures look amazing, this is of little help on a foggy day. If the weather permits it, the cable car to Eggishorn seems a very good and economical choice. On a clear day you get to see the glacier rolling down the mountain. And without 50cm of snow there are easy trails you can take from there. Pricewise you come in at 40 CHF and do not need to reserve in advance. Check the webcam before heading there and up. Between Bettmerhorn and Eggishorn you can follow the Unesco trail. However, it was closed for the rest of 2017 due to repairs. And even if it had been open, the adverse weather conditions would not have allowed for it. On top, it's classified as a difficult hike. Finally, there is the option to go to Kandersteg like Els did and I ended up doing, too. The lake, which is in the core zone, is way lower, so snow is less of a risk. If you have more time, you can just keep on walking into the mountains. Kandersteg also the cheapest option (25 CHF). The Swiss seem serious about hiking and less serious about securing trails. Take the trail difficulty at face value and come equipped. Check the weather in the morning. Check the view for wherever you are heading via webcam. Bring proper clothes. It gets cold up there. Please check out the Swiss Travel Pass if you plan to use public transport. Two long train rides already cover the three day pass. On top you can take care of all tickets already from home. Finally, you also get discounts for cable cars etc. E.g. I paid 20 CHF instead of 40 CHF for the ride to Eggishorn. 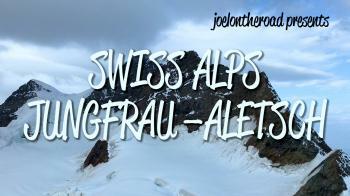 From Jungfrau Aletsch you can follow the tourist masses and continue to explore the Swiss Alps, e.g. in Zermatt or Andermatt. Given the very good public transport infrastructure in Switzerland, you can easily reach most sites in western Switzerland. The closest Swiss world heritage site is Bern. Heading South and ticking off Monte San Giorgio and Bellinzona is also possible. From Brig trains run regularly to Domodossola and Milan (2h) and the nearby Sacri Monti. I had a very nice time Lago d'Orta and encourage you to travel there. The Reichenbach you will pass is the Reichenbach of Sherlock Holmes fame. I visited this WHS in September 2014. The 4000+ metre mountains were immediately visible from as far as Lauterbrunnen or Interlaken. I drove to Grindelwald where I had my hotel and ample parking opportunities. Grindelwald is just beneath the Eiger mountain (3970m) but the peaks of Wetterhorn (3701m) and Schreckhorn (4078m) are also clearly visible from town. There are several uphill trails to take in the scenery but if you're just a beginner taking the trains up and choosing a trail down could be a pleasant and less tiring option. The lavish greenery dotted with brown cows changes to rocky landscape, ice glaciers and snow capped mountain peaks as you arrive at Kleine Scheidegg (2061m). After checking the weather forecast several times and being lucky enough to visit on a sunny weekend, I opted to go for the Jungfraubahn Top of Europe experience which cost me 177 swiss francs for a return ticket, making it the most expensive WHS I have ever visited. Since I was staying in Grindelwald, I only had to change one train which was fine. The first train from Grindelwald left around 07:15 meaning that I got to Jungfraujoch before 09:00 (around 1hr 45mins including panoramic view stops). At Kleine Scheidegg, I changed trains to the actual Jungfraubahn after gazing at the Eigergletscher. The fact that I moved around and spent most of the train stops outside helped me avoid altitude sickness. The Jungfraubahn stops twice for panoramic view stops before reaching Jungfraujoch. First stop is at Eigerwand (2865m) and the second stop is at Eismeer (3160m). Along the way a short video clip is displayed on the several screens giving a brief overview on the history, construction, biodiversity of this amazing part of the Swiss Alps. Jungfraujoch (3454m) is the highest railway station in Europe and it is quite popular with tourists all year round. Luckily, although I visited on a weekend, there weren't very many people. Perhaps because I arrived there early as most groups tend to arrive around lunch time to eat at the Jungfraujoch Restaurant. Before the groups arrived, I explored the touristy Ice Palace (nothing extraordinary there) and took the elevator up to the research station and Sphinx observatory (3571m), which is one of the highest observatories in the world. Next I walked to the open plateau where I stood in awe at the incredible panoramic views of the Swiss Alps and the 23km long Aletsch glacier, the largest glacier in the Alps. After I took a never ending number of photos, I bought some Swiss chocolate and headed towards the Snow Fun area. Here there is a short zipline, a couple of lanes for snowtubing, snowboarding and skiing and a glacier bar. This is what most tourists get out of the Top of Europe experience which is a worthwhile experience especially if you haven't seen glaciers or been close to high mountain peaks before. The price is the only drawback really. Similarly to Hallstatt and Salzburg, Asian tourists come here all year round, so much so that there are UNESCO information boards of Mt. Huangshan next to the ones of Jungfrau. Having enough time at my disposal, I decided to make this visit a lifetime experience and I hiked up Monch (4107m), the second highest mountain situated just next to Jungfrau (4158m). I will never forget the views from the top! What an unforgettable experience. Overall, this is my favourite WHS in Switzerland and I wouldn't mind visiting again to do the glacier walk. I visited several parts of this site. From Kandersteg I took the cable car to view the Oeschinensee, a high lake surrounded by mountains. From Goppenstein I took a bus up the Lotschental, past the Bietschhorn to Fafleralp and hiked up to the Lang Glacier. From Grindelwald I had magnificent views of the Monch, Eiger and Jungfrau, all in their pristine beauty. But the core of this site, the Aletsch Glacier remained elusive. I could have taken the train from Grindelwald to the Jungfraujoch and viewed it from there, but the cost of this was prohibitive. So I tried a cheaper route: from Brig station I took a bus to Blatten from where I took a cable car to Belalp. A 20 minute walk from the cable car station brought me to the Belalp Hotel and a nearby church and lookout. To my dismay cloud filled the valley below. By studying the maps at the lookout and found the direction where the Aletsch Glacier should be. As I watched the cloud began to clear and a river appeared way below. Then it cleared more and the glacier appeared, curving up towards distant mountains. After a few moments it disappeared again, and I returned to the cable car to the accompaniment of cow bells. Staying at the very touristy town of Interlacken (or smaller and yet more touristy Grindelwald) I drove up several mountains. The Trümmelbach waterfalls are nice to visit. There's also a train leaving Grindelwald to the top of the Jungfrau Joch which is the highest train station in the world. It costs a fortune (as so many other things in Switzerland) and I found it underwhelming, mostly because the scenery looks much more exciting from below than from the summit where you can only see the icy summits around. The Jungfrau-region is very fascinating, both on distance when viewed from distances up to 150 km (!) and closeby, ranging from 25 km (Interlaken and environment) up to Grosse Scheidegg and even closer. A hike to the Jungfraujoch can only be done by skilled mountain-climbers, but the railway provides a great means to reach this vantage point from where a wonderful vista unfolds itself over the Grosse Aletschgletscher, the largest glacier of the Alps. After 15 years of hiking in this area I never grow tired of enjoying this natural majesty, shooting many pictures every year of landscapes, geological structures, plants (up to 3000 species in Switzerland), and animals that can be seen in abundance here. To my surprise the picture depicted here (April 17, 2006) I see the Silberhorn, only a small part of the Jungfrau mountain, which towers the region with its top of 4158 m (13,642 ft). I was managed to wake up early enough and prepare to take the train at Grindelwald. It's quite freezing in Switzerland's September. There were 2 trains we need to transfer in order to go to Jungfraujoch. Inside of the station, a video was shown to introduce how this railroad was constructed and completed. It was just amazing to see how people can accomplish such a diffifult task. We went to the top of the station and enjoyed the panaramic view. The nature of glacier, needless to say, is breathtaking. Unfortunately, it was too windy and cold to stay too long outdoor. I bought a postcard from the highest post office and sent it to myself as a souvenir; to remember this beautiful place forever. This glacierfield is the largest one in the European Alps and quite impressive. You can take a special train up to the Jungfrau and you have to change trains twice and you climb up the mountain higher and higher over the course of 3 hours. The last part of the train trip is actually through the mountain and then you end up at the highest railway station of Europe at 3454 meters high; the Jungfraujoch. Since you climb up so fast most people will have a little bit of altitude sickness. At the station you can go outside to see the glacier and shoot some pictures of the view and there are ice caves that are cut out of the glacier. The whole thing is quite touristy and pretty expensive, but if you have never been high up on the mountains and never seen glaciers before it might be worth it. It's difficult to believe what nature has in store for you sometimes. Amazing!! its gorgeous. When i was on top, out in the huge balcony, Nothing came out of my mouth, when i first saw it. Beautiful, Marvelous view. If you do get the chance, to go up to Jungfraujoch: The Top of Europe. SBB will take you up to the bottom of the mountain, and then a special train - which is very expensive at CHF150- will take you up to the observatory known as Top of Europe. I was fortunate to get a very special deal, where I commuted all the way from Geneva at about CHF189. There are scientific experiments being undertaken up there, including global warming, pollution, oxygen levels and so on. The view is amazing, absolutely stunning views of glaciers and green, especially in May and September. This is Switzerland at its very best. You can ski, use discs as surfboards in the perpetual snow at 10,000ft. Take in the Eispalast, a beautiful museum of ice carvings, and two levels of viewing, the Sphinx area being the better one. The restaurant is not bad either. This was one of my most memorable trips. 4.5: Frederik Dawson Craig Harder Nolan B. From "Jungfrau-Aletsch-Bietschhorn" to "Swiss Alps Jungfrau-Aletsch"
Tectonic processes: Criterion (viii): ...., the region displays 400 million-year-old crystalline rocks thrust over younger carbonate rocks due to the northward drift of the African tectonic plate. Glaciers: AB Review "Aletsch Glacier, the largest (128km2), the longest (23km) and deepest (900m) in Europe. The Fiesch glacier is the third largest and second in length in Europe" and "the 23km length of the Aletsch glacier is longer than the ice streams flowing from the Everest/Lhotse massif with its 17km Khumbu glacier, 16km Rongpu glacier and 8km long Lhotse glacier"
Rhone: The Aletsch Glacier and other valleys of the sites drains in the Rhone. Literature: Criterion (vii): The impressive landscape within the property has played an important role in European art, literature, mountaineering and alpine tourism. Fatal Accidents or 'disasters': July 2006 6 Swiss soldiers died in an avalanche on the Jungfrau.